I'm here... I'm alive... And I have a lot to tell you. But before I get to all that, we need to get signed up for the January Friday Night Sew In!!! It is this FRIDAY!! January 25th!! I have so much to work on! Husband will be out of town Friday, kids can be in bed so off I sew! Glad you are with us. Not that I worried, exactly, but I did wonder. Been hoping you all would have this again this year. I missed all of last year. Will be sewing on a quilt top. Happy New Year...looking forward to stitching away knowing others are doing the same..
Whoo hoo! I have lots to do. Yay! Glad to see you back. I thought FNSI was last week, so I did it myself. I'll be happy to join again this week. Happy New Year Heidi. Looking forward to another year of FNSI! creating with friends on Fridays is the perfect way to end the week. Yay....first FNSI of 2013. I've got several projects in the works with some to FINISH and several I'm right in the middle of, and really want to start a new one. So, by Friday I will have to make a decision. Thanks for hosting. I should find out tomorrow if my dead Bernina can be saved ... What I will be working on will depend on how it goes tomorrow, but either way, I'm ready for some FNSI as therapy. Glad to see you back in blogland, and looking forward to another FNSI! I wandered in via a link at 16 Muddy Feet and this looks like my kind of party. 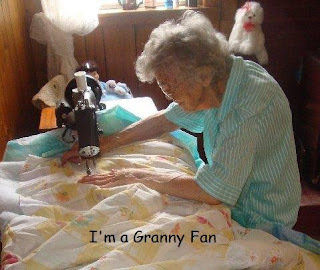 I will be sewing in with all of you this Friday night. FINSI - a good reason to get soem movies form the library and work till mindnight without getting a bad conciousness. Looking forward to a night of sewing have purchased all my bitsy. Needing time out. I haven't participated in FNSI in a while, although I'm usually sewing on Friday nights. Hope to make progress on a couple of things. Thanks for hosting this in 2913 too! Hi I'm #53. I usually sew on Friday night so might as well hop aboard! Looking forward to sewing like a maniac with everyone! Looking forward to Sew-In Friday! I have some binding to get sewn on, or a ton of other projects I need to work on! I haven't been sewing a lot lately and miss it. This will help me get back into it. I think I am finally well enough to participate in FNSI. I'm hoping to make 2013 the year that I participate more in things that I sign up for! I'll be working on 2 leftover Christmas projects - 3 stockings and a table runner. I've been missing these lately, so really gonna do it this week. I have some Hexi's I've been working on, so this will give me a little motivation. At least you haven't frozen up there. Brrr....it has sounded cold in your area. So happy to see you're back! I've got plenty to work on so let's go! Not sure where January has gone but I'm in!!! I'm working on a D9P just for me! I'm so looking foreward to doing this tonight. Oh FNSI - how much I have missed you!! Can't wait! Sign me up for FNSI. I had better get something out and ready to sew! Yay!!!! been missing you! I'm in! See you tonight! I haven't participated in this for awhile now so I'm glad to be back! Happy Sewing everyone! This is my VERY FIRST FNSI...I have lots of projects to work on! It will actually be Friday Night Sew Out for me as I am going to a quilt class. But I'll sew earlier in the day at home. This will be my first time joining and I'm very much looking forward to it. I think I just successfully signed up!!! I know how to stitch now to learn more about blogging. Looking forward to a great night of sewing!! What perfect timing this is! I'm a little bit late to the party for signing up, but I'll definitely join you tonight. I've just come back from a two week rotation in a mining camp, and have a brand new sewing room to break in (after I move a bunch of junk from my recent move, that is)! After just finding out that hubby and I won't be going down to the City, I thought I'd hop on the Friday Night Sew in. Signed up late, not sure what I am going to sew yet but I will work on something. I finally finished the quilt top that I had to tear apart so tonight I'm basting and starting the quilting. Hubby has a graveyard shift so I can stay up as late as I want! My granddaughter is having a sleepover birthday party tomorrow night. We were making the sweet heart shaped earbud pouches from Dog Under My Desk for each of her friends. It was so much picking the fabrics together. Just posted my first FNSI on my blog and a few photos on the FLICKR group. Thanks for the fun! I got some stitching done tonight, but almost missed the signup! Thanks for hosting. Hi Heidi, I actually sewed this Friday night :) when often I end up signing up and slacking. Sewed up a KS empire waist wrap top, am at the hemming stage. Cheers! I sewed too and loved every minute of it! Thanks for hosting! I love Friday nights, it is my night to sew. I turn on the local University Radio Station CSJW and listen to good music and sew all evening, usually trying to keep up with the Rainbow Scrap Challenge. Signing up late because Sunny (Quilting Dreams) told me to. I am vacationing on my own and have so much time to sew....heaven. Little late with joining in, but I did get a little done on Friday night.